Nicola Sturgeon has paid tribute to the “courage and dignity” of the Aberdeen families who fell victim to the baby ashes scandal. The first minister said she welcomed the publication of Dame Elish Angiolini’s shock report, which uncovered “abhorrent” practices at the city’s crematorium. The National Cremation Investigation revealed infants were often cremated in the same chamber as unrelated adults. Ms Sturgeon told parliament yesterday her government would implement all the recommendations of the report. Her comments came after council boss Angela Scott refused to rule out dismissing staff caught up in the baby ashes scandal and offered to meet the grieving families. North East MSP Ross Thomson raised the matter with Ms Sturgeon at yesterday’s first minister’s questions. She said: “This is a very important – and, for many families, difficult – issue. I welcome the report which of course is the culmination of several years of work investigating why these mistakes were able to happen. “I pay tribute to the courage and dignity shown by the families who have been involved with the investigation, as well as other earlier investigations. The first minister said her government had “already made a number of important changes”, including appointing an inspector of crematoria. 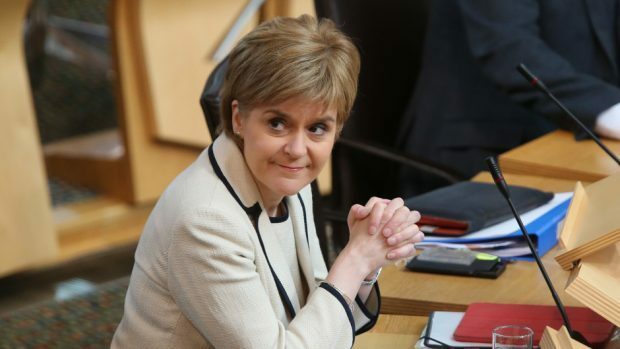 Earlier, the first minister berated the “reckless and selfish behaviour” of Westminster Tories over the EU after the Scottish Conservatives leader warned her against breaking up the UK. In a testy exchange, Ruth Davidson told the SNP leader to stop exploiting the Brexit vote to try and break up the UK, which the Edinburgh Central MSP said represents a greater threat to Scotland’s economy. Ms Davidson said Scotland exports four times more to the rest of the UK than all the member states put together. The first minister said Ms Davidson was trying to impose an “either/or” choice on Scots when it was the “Conservatives who have recklessly brought this country to the brink”.